Man falls into a hole. The walls are too steep, smooth and high to climb out. Soon a priest comes along and the man yells for help. The priest scribbles a prayer on a scrap of paper and drops it into the hole and goes on his way. The next person to come along is a doctor. The man hollers from the darkness, “Can you please help me?” The physician writes a prescription and drops it in. The next person to pass by the hole is the man’s friend. The sun is setting and the man is anxious. He cries for help. 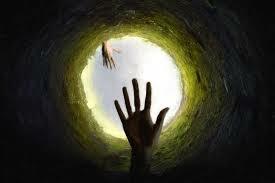 The friend jumps into the hole.